I recently purchased a NiSi Natural Night Filter, a filter designed to block certain wavelengths of light, namely those produced by sodium vapour and mercury vapour lamps. Sodium vapour city streetlights are what cause night shots in cities to have such a dominant yellow/orange colour cast. In the animated GIF image above, you can see what a dramatic difference the filter makes! Also check out the linked gallery above for some extensive comparisons. 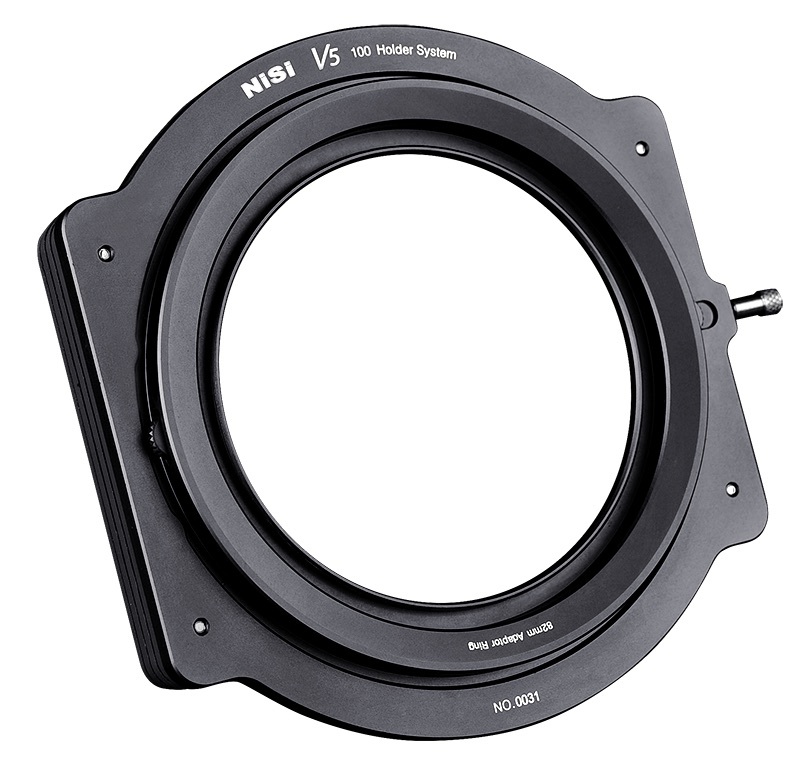 NiSi’s filter holder is a very nicely machined and packaged system that is a bargain when you consider the accessories it includes. 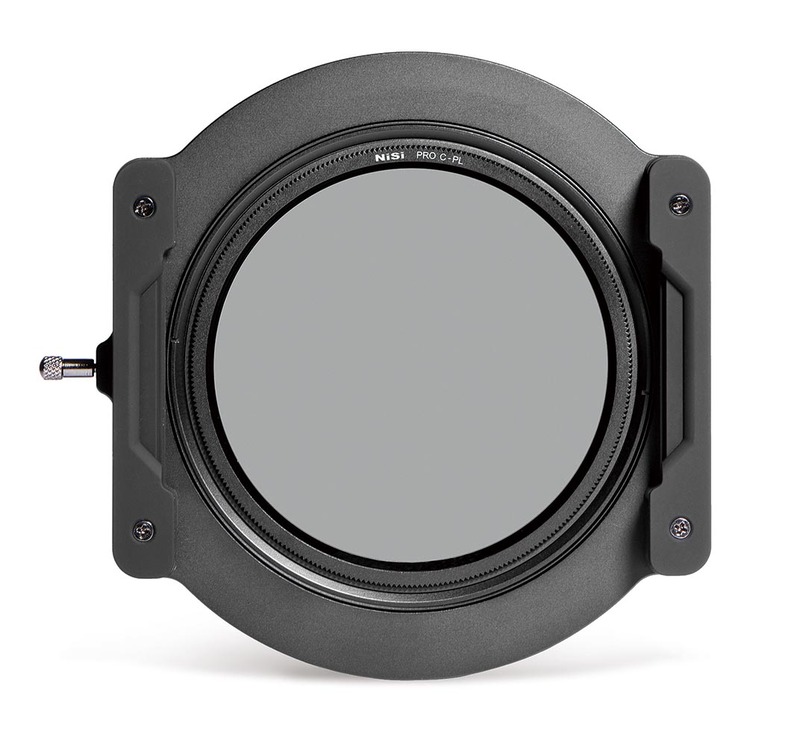 The basic filter holder has room for three 100mm slide-in glass filters and it has a mechanism for attaching an 86mm slim multi-coated circular polarizer. The 86mm polarizing filter is actually included in the price and when mounted, there are small thumbwheels that let you rotate the polarizer independently of the main holder, very useful if you are using the polarizer in conjunction with, for example, a 100mm graduated ND. In addition, the kit also includes four adapter rings so the holder system can be attached to lenses with 67mm, 72mm, 77mm and 82mm threads. 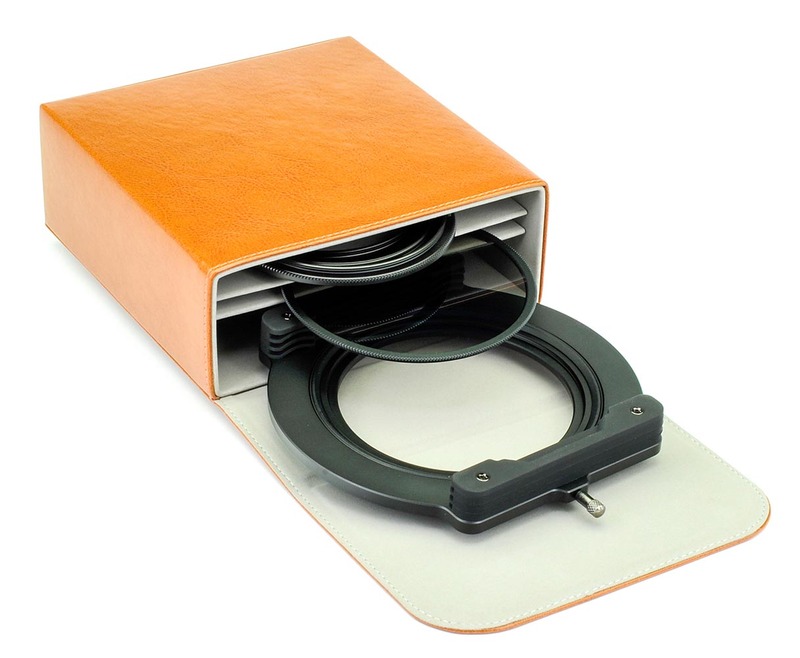 The kit also comes with really nice and well fitted, hard leatherette case that has a magnetic closure, which has room for the holder with up to three filters mounted, the CPL filter and the four adapter rings. I have found the precision of machining and the anodization quality of the filter holder system to be top notch, and the carry case is nicely done too. 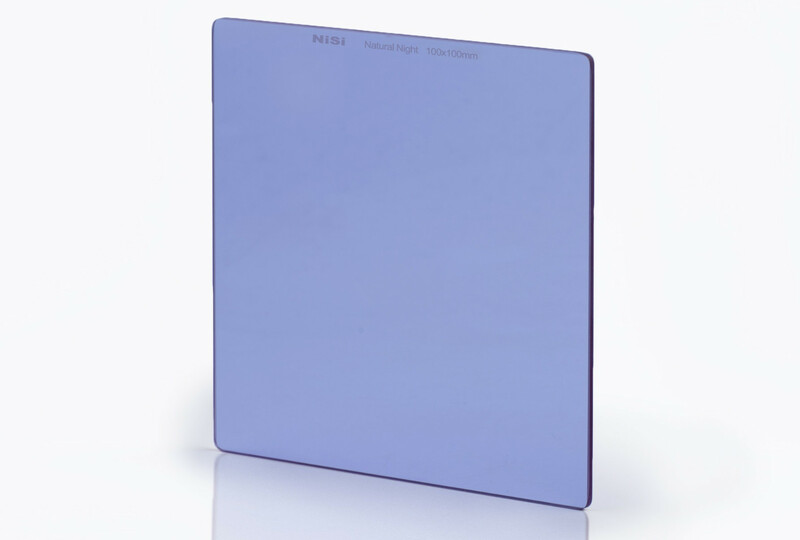 With the NiSi holders, the glass filters are held in place with slight edge pressure, rather than pressure along the surface of the filter near the edges. The benefit of that is that if there are different thicknesses of glass filter, they should all be held with consistent tightness, and since nothing at all is touching the surface of the glass, you don’t have to worry about abrasion of the filter’s surface along the edges. In addition, this lower profile design may allow for slightly greater field-of-view with the 100mm square filters, useful when using wide angle lenses. Keep in mind that I am a total novice when it comes to drop-in filter holder systems, and I’m not sure if any of these seeming advantages are actually significant in real-world use? One minor drawback is that I believe the filters may be slightly harder to line-up and slide in than, for example, with a Lee filter holder system. The attachment point where the holder attaches to the adapter ring that screws onto your lens, is one other source of caution. While the machining is precise and the parts fit perfectly, the relatively tight fit means that it is a bit fiddly to attach and detach the holder from the adapter rings at times, especially when mounted on your lens. A more sloppy connection point, as long as it locks positively, might actually be easier to use. It might have been harder for me though, since I have only been using the system in the dark! Still, I quickly got used to those quirks and can’t complain too much, especially with its modest price. Note that the NiSi holder should work with any other brand of 100mm drop-in filter, and of course the Nisi 100mm filters should just as easily work with any other 100mm filter holder system that you might already own. Which brings me to the NiSi NNF, which is pretty much only useful in the dark too of course! As mentioned before, this filter will selectively block only certain wavelengths of light, mainly those produced by sodium-vapour lights, mercury-vapour lights and a few other low-CRI light sources. The main effect of this, is to significantly reduce the nasty orange glow that will often deteriorate nighttime cityscape photos, as well as reduce light pollution that muddies up shots of the night sky when there are nearby cities. I have found it extremely helpful in improving the look of my night shots taken in cities. The filter effectively lifts the fog of orange glow and lets all the subtle variations in colour of other light sources shine through. While a combination of custom white-balance and selective colour adjustments in Lightroom or Photoshop can significantly improve unfiltered shots, you still lose a lot of subtlety. For example, while you can dial back the saturation of orange in Lightroom, that will affect a very broad frequency band and is nowhere near as selective as the NiSi NNF. Dialing back oranges in Lightroom means that anything that has an orange or near orange colour will be affected, whereas the NiSi NNF can filter out the orange light from sodium-vapour lights, but leave other, slightly differently hued oranges mostly intact. I have several examples of photos where the orange glow has been cut, but you can see some other areas of the image that are still showing orange light in spots. You can be more selective in Photoshop, but then you may need to be careful of “edge effects” or hard transitions, if an orange you are dialing back happens to blend with a slightly different orange. I have not noticed any NiSi NNF transition issues in any shots so far; they all look smooth and natural. For an example of manually corrected orange glow in an unfiltered shot, see photos 15 and 16 in the linked gallery, which are duplicates of 13 and 14, but with different processing. Photos 15 and 16 each have a custom white balance taken from the same spot on the side of one of the concrete buildings. So, unlike the other image pairs, the WB settings in Lightroom were different in 15 and 16, in order to neutralize the colour cast of each shot independently. This serves to demonstrate that just a simple white-balance correction cannot achieve what the NiSi NNF filter provides out-of-camera. Note that the original version, photo 13, is warmer than the neutralized shot, photo 15, but then I usually do like slightly warmer lighting in night shots. However it order to do a precise click WB comparison between 15 and 16, I decided to leave the WB as is. I have done a lot of nighttime cityscapes over the years and so have lots of experience adjusting photos to make them look good, but my reaction to the first comparison shots I did, with and without the NiSi NNF, was simply… WOW! I was blown away by how easy it was to capture a near-perfect shot, straight out of camera, without needing to do any selective colour manipulation in Lightroom. The only thing I generally did that affected the colour of a NiSi NNF filtered shot, was a minor tweak off of daytime white-balance. The NiSi NNF has a slight blue cast, which helps correct incandescent light sources towards daylight too, but shots done on daylight (sunny day) white balance still look a bit too warm for my liking. The NiSi NNF is multicoated and I have not seen any flare caused by the filter itself from bright light sources in the frame. I did have a slight softness issue when using my longer telephoto zoom, at 200mm plus, but for now I am attributing that to a dim light, nighttime focus error on my part. I cannot really see why a tele lens should be affected more than a very sharp wide angle prime, and all the shots with my wide lenses were tack sharp with zero loss of resolution when comparing the filtered to the unfiltered shots. I will have to do some more careful testing to see if the telephoto issue happens again, so I may report back with an update in a future installment. Apart from the NiSi NNF's obvious benefit when shooting nighttime cityscapes, I was recently out at Pitt Lake, planning to do some tracked night shots and had an opportunity to test the NNF for night-sky shots as well. While the skies are relatively dark, being in Pitt Meadows means that there is still some pervasive sky-glow from Vancouver, Pitt Meadows and Maple Ridge. Not only did I take some night sky shots, but as luck had it, I also had a chance to try it on a beautiful display of Northern Lights! Despite the north facing sky being the darkest direction you can face at Pitt Lake, it turns out that even for that, the NiSi NNF helped. The aurora was predominantly green at first and the NiSi filter didn’t have too much effect, but later on the green faded and the camera captured all sorts of beautiful subtle shades of blue and purple, even though those colours were mostly invisible to the naked eye. Using the NiSi NNF caused the subtle blues and purples that the camera captured to pop a little more (photos 23 and 24), although it may be a bit hard to see depending on your monitor calibration. I think that there is still enough sky-glow from city light-pollution that the glow partially obscures the really faint blues and purples. If I had been under truly dark skies, away from any city, then I don’t think the filter would have had any benefit. You can also perhaps see that the snow in the distant peaks has a bit of an orange glow on the second shot (24), which is not present on the filtered photo, and even the sky near the top of the frame has a faint glow from the light pollution, not being quite as black as the sky in the filtered shot. A dramatic comparison is seen (photos 25 and 26) where I used a star tracking mount to do a two minute time exposure with my 90mm f/2 Fujinon lens of the region in Cygnus that contains the “North America Nebula”, which is near the bottom left of the frame, lying on its side, so to speak. I really cranked up the contrast and vibrance in that shot, in order to show the faint red emission nebulae, so the orange sky-glow in the unfiltered shot is greatly exaggerated, which was of course processed with the same settings as the one with the NiSi filter. The NiSi Natural Night Filter certainly isn’t cheap, but its currently near unique ability to selectively filter light is compelling if you do a lot of nighttime cityscapes, or just do night photography in general under light polluted skies. The only other similar filter that I’m aware of, costs more in USD than the NiSi does in CDN, so nearly 40% higher, so from that standpoint, the NiSi NNF is quite reasonably priced. Updated this post today with my full review and comparison image gallery.